Dengue is caused by four different serotypes DEN1, DEN2, DEN3, and DEN4 viruses belonging to flavivirus genus (family-flaviviridae). All four serotypes are found in India. The disease is transmitted by female Aedes aegypti and Aedes albopictus mosquitoes. Usual manifestation is a short febrile illness dengue fever. Dengue hemorrhagic fever and dengue shock syndrome can occur in severe cases. Vision-threatening ocular manifestations are usually seen when platelet level is critically low. 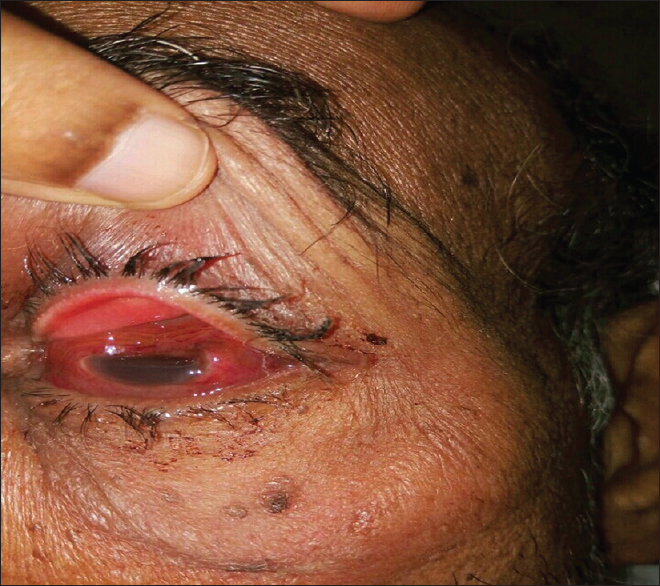 A 72-year-old male presented with acute bleeding from the left eye 10 days after the onset of dengue fever. He had swelling and redness in the left eye 3 days before this while he was on treatment from another center for dengue. The patient had no comorbidities. On examination, the left eye had periorbital edema, 360° hemorrhagic chemosis, and corneal perforation at the temporal limbus with reddish-brown discharge. The anterior chamber was collapsed. Details of iris, lens, and fundus were not appreciable [Figure 1]. Intraocular pressure (IOP) was digitally low, and the documented vision was light perception with inaccurate projection. The right eye was normal with 6/36 vision. Investigations showed platelet count of 1.73 L. However, the lowest count was 50,000 cells/mm 3 recorded from the previous center 2 days before presentation. Blood parameters were within normal limits. ANA and anti-dsDNA were negative. Swab culture was sterile, and computed tomography (CT) orbit revealed proptosis of the left eye and periorbital inflammation. He was managed with topical and systemic antibiotics and supportive measures. Since there was purulent discharge after 3 days, it was planned for intravitreal antibiotics. But in view of panophthalmitis, the eye was eviscerated [Figure 2]. Repeat culture sent at the time of evisceration was negative. The wound healed well, and he is under follow-up. 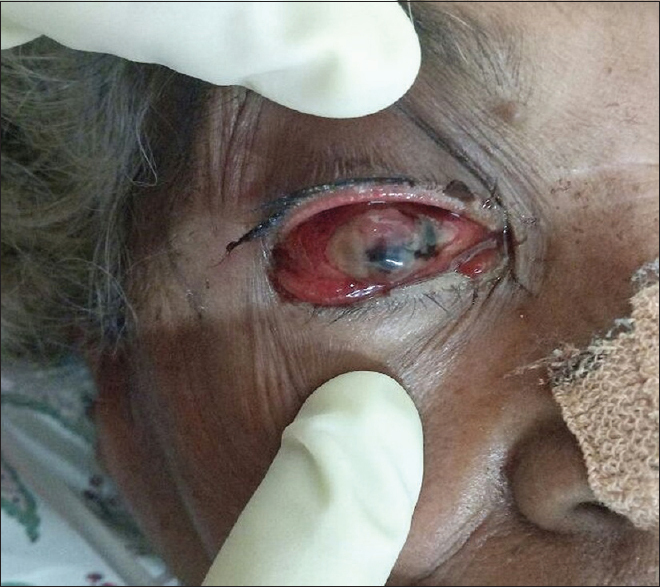 A 72-year-old female presented with bleeding from the right eye, which was preceded by redness, pain, and swelling of the eye for 5 days. The patient had metabolic encephalopathy at presentation due to hyponatremia. She had a history of dengue fever 2 weeks back and was on treatment in another center. On examination, the right eye had periorbital edema, 360° hemorrhagic chemosis, and central corneal perforation with brownish discharge. Details of other structures were not made out. IOP was digitally low [Figure 3]. The left eye was normal except for a mild chemosis. Vision could not be assessed at the time of presentation due to disorientation. Platelet count was 1.98 L/mm3 at presentation. The lowest count was 18,000/mm3 2 days before commencement of ocular symptoms. Serum sodium level was106 mEq/L. Other blood parameters were normal. Conjunctival swab sent was sterile. CT orbit is taken from the previous center before rupture showed minimal proptosis, increased intensity in the anterior chamber, and vitreous with distortion of the eye contour. All features were suggestive of panophthalmitis right eye [Figure 4]. She was treated with topical and parenteral antibiotics, pressure bandage, and other supportive measures. Hyponatremia was corrected. Her sensorium improved after 2 days. Vision in the right eye was PL- and that of in left eye was 6/24. The right eye became phthisical and she is under follow-up. 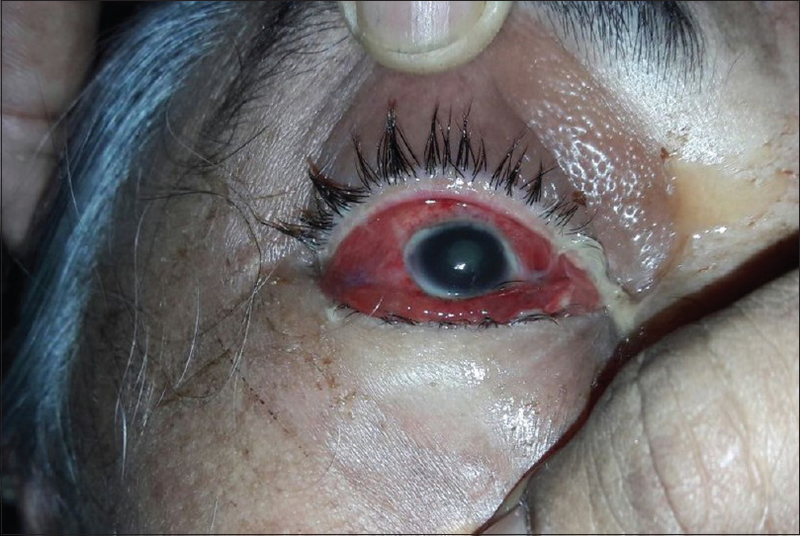 A 65-year-old female who had just recovered from dengue shock syndrome (managed from elsewhere) presented to emergency department with swelling and pain of the right eye for 3 days. She had systemic hypertension, and was on regular medication. She was conscious and oriented, and vitals were stable. The right eye had periorbital edema and erythema with 360° hemorrhagic chemosis. The cornea was clear. The anterior chamber was shallow with exudates in pupillary area. Pupillary reflexes were absent. IOP was digitally high and lens details not made out because of exudates. The vision was PL- in the affected eye [Figure 5]. The left eye had minimal chemosis with a vision of 6/12. Her platelet count was 73,000/mm 3 (lowest count - 35.000/mm 3 2 days before presentation). Other parameters were within normal limits including LFT and RFT. 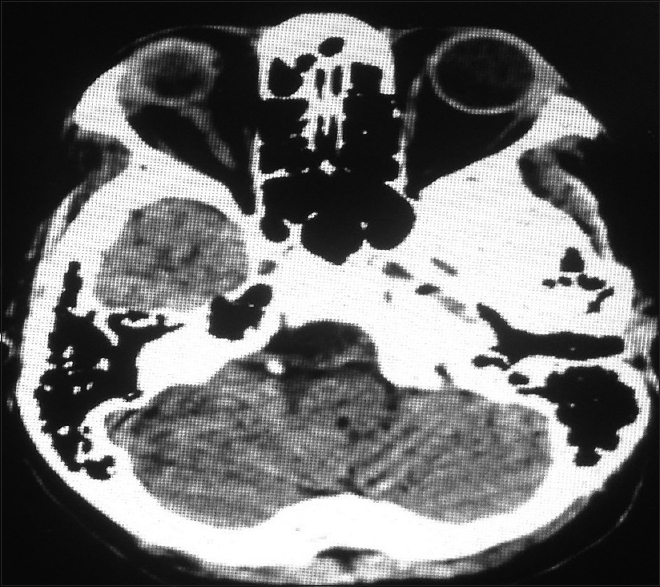 CT and MRI features were suggestive of orbital cellulitis of right eye [Figure 6]. She was treated with topical and parenteral broad-spectrum antibiotics, mannitol, pressure bandage, and other supportive measures. On second day there was spontaneous rupture in the center of cornea with pus. Proteus mirabilis was isolated from the swab culture. Antibiotics changed according to the sensitivity pattern. She was improved symptomatically and the eye was phthisical at the time of discharge. Now, she is under follow-up. It is postulated that immunological mechanisms mediated by T cells, and inflammatory cytokines are responsible for the ocular complications along with thrombocytopenia. Vasoactive and inflammatory mediators such as ILs, tumor necrosis factor, platelet-activating factor, and urokinase cause capillary leakage, which is responsible for the macular edema and breakdown of blood-aqueous barrier leading to uveitis and periphlebitis.,, Platelet dysfunction and consumptive coagulopathy also contribute to the pathology. Proptosis in dengue fever could be due to retrobulbar hemorrhage or panophthalmitis. Possible mechanism for globe rupture could be an increase in intraocular and intraorbital pressure secondary to retrobulbar, suprachoroidal, and intravitreal hemorrhages., Exact etiology of panophthalmitis is not known. It may be due to the viremia causing embolization of infective material through retinal vessels, occurring at the nadir in platelet count. After establishing a septic focus in the retina, infection could have disseminated throughout the retina, vitreous, and anterior segment. In conclusion, dengue eye disease is emerging as a major cause of ocular morbidity. 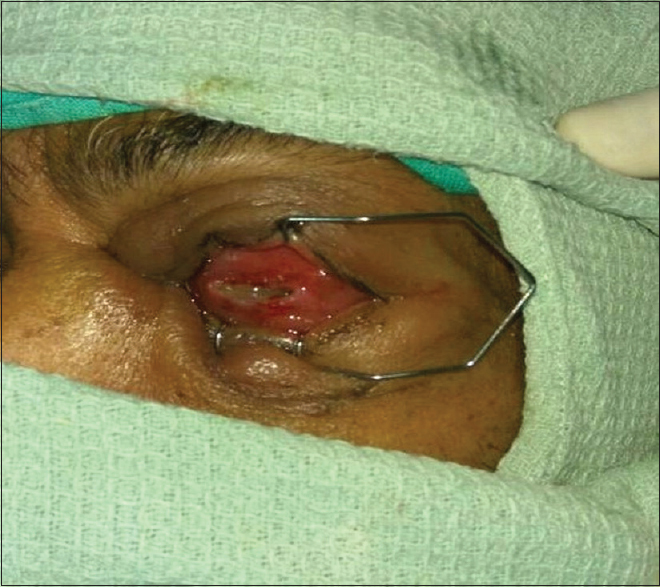 This case series is reported for its rarity and also to stress the need to be vigilant of the vision-threatening complications, so that measures if possible can be taken early to prevent such complications. Yip VC, Sanjay S, Koh YT. Ophthalmic complications of dengue fever: A systematic review. Ophthalmol Ther 2012;1:2. Juanarita J, Azmi MN, Azhany Y, Liza-Sharmini AT. Dengue related maculopathy and foveolitis. Asian Pac J Trop Biomed 2012;2:755-6. Velaitham P, Vijayasingham N. Central retinal vein occlusion concomitant with dengue fever. Int J Retina Vitreous 2016;2:1. Chan DP, Teoh SC, Tan CS, Nah GK, Rajagopalan R, Prabhakaragupta MK, et al. Ophthalmic complications of dengue. Emerg Infect Dis 2006;12:285-9. Nagaraj KB, Jayadev C, Yajmaan S, Prakash S. An unusual ocular emergency in severe dengue. Middle East Afr J Ophthalmol 2014;21:347-9. Kulkarni AG, Athale N, Sheth K, Rathi A, Shinde V, Deshmukh S, et al. Globe rupture – A rare ocular manifestation of dengue fever in convalescent phase. Int J Sci Res 2016;5:1727-9. 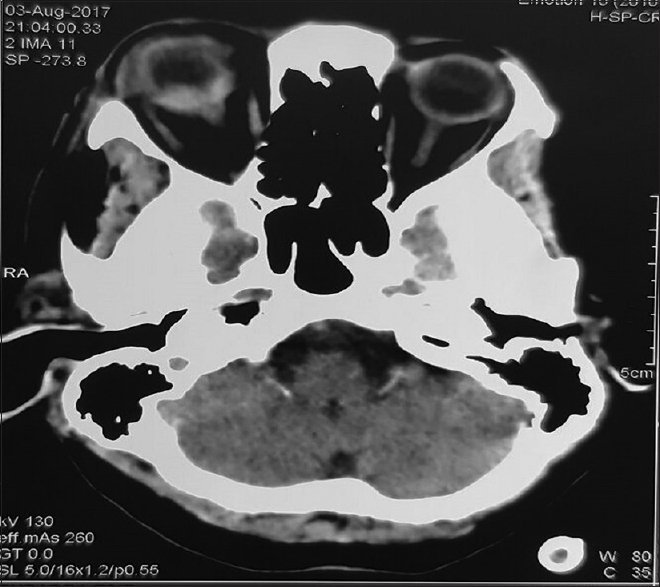 Sriram S, Kavalakatt JA, Pereira AD, Murty S. Bilateral panophthalmitis in dengue fever. Ann Trop Med Public Health 2015;8:217-8.